A priest of the Order of Mary Magdalene and a skilled anthropologist, Isabel Burke has been called offworld to the barren planet of Virimund. The ExtraSolar Corporation, developing Virimund as an energy source, has encountered an ‘incident’ that has stopped their work. It seems there are people on Virimund after all–descendants of an emigrant ship that left Earth three hundred years before. And something has changed them. There are children born on Virimund who do not age. Upon discovery, these lost souls are sent to an island where they live by themselves, ashamed that they will never become truly human. One of these children has been captured by ExtraSolar, which hopes to discover the secret to her ageless existence. Under constant examination and study, the girl has yet to utter a single word. For ExtraSolar, she is a resource to be used and discarded. But for Isabel, she is an innocent who needs help. Initially a conventional first-contact story, Marley's sensitive, lyrical SF novel, set on 23rd-century Earth and the oceanic world Virimund, swiftly evolves into a meditation intertwining spiritual values, godhood itself and romantic love. . . the book treats feminism's central issues gently, skirting the strident swamps of passion and the fatal abyss of sentimentality, with tender insights into love and sacrifice all too rare today. Louise Marley's powefully edifying science fiction thriller pits a woman priest against a corporation bent on using an idyllic oceanic planet as an energy-producing power park, and determined to exploit a group of extraordinary children from a lost colony. . . Like Marley's other novels, The Child Goddess is a passionate and deeply spiritual story powred by her adept characterization. Marley crafts realistic, three-dimensional characters that readers can't help but empthize with. If famed Trappist monk and poet Thomas Merton ever wrote science fiction, it would resemble a Marley novel. Because it is set more than 300 years in the future and its characters undertake intersteallar travel, Louise Marley's seventh novel, The Child Goddess, is classed as science fiction. In other respects it is a literary novel, with characters whose inner struggles are as important as the plot. There is enough of the latter to satisfy hard-core fans of the genre who like a healthy dose of speculative science to go with offworld settings. . . Marley . . . has the gift of tackling deep issues in the context of a compelling story. Isabel is an extraordinary character, torn between faith and love, duty and sacrifice. Oa is also a fascinating creation: a young girl who has lived more than a century but remains a child. Marley describes this futuristic Earth with just enough detail to bring it alive without overwhelming the reader. An exploration of the mysteries and complications of being human disguised as a science-fiction adventure, this is a novel not to be missed. Personal journey sagas are the hardest to tell, because they take place almost exclusively in the character's mind. But when they're told well, such tales are truly memorable. Louise Marley has taken an intense personal growth tale and infused it with quiet energy in the understated The Child Goddess . . . The novel's power lies in this low-key approach. Isabel is a character with flaws, some close to the surface and some more deeply hidden. But she deals with those inner problems with a compelling grace and dignity. Marley attacks the problems she poses satisfactorily, with a well-placed plot and characterizations, in particular, that are engaging even amid the tangle of interpersonal relations. The Child Goddess is an engaging story that one cannot help feeloing compelled to read. Louise Marley writes in an easy-going style and has a true gift for story-telling. She also aims to deal with some hard issues . . . this does nothing to detract from the success of this novel; it is science fiction at its most appealing--light on the science and heavy on the fiction. In The Child Goddess, Marley brings together religious and medical ethics and asks what we want from the universe and how far we are willing to go to get it. This interesting novel will generate much discussion among readers.
. . . This is a tender story, filled with images of religious faith, romantic love and its disappointments, haunting loss, and new interpretations of just what it means to be human--to possess a soul. Local author Marley is at the peak of her form. Her universe is internally consistent--while this isn't a sequel, characters refer to events in previous novels. . . 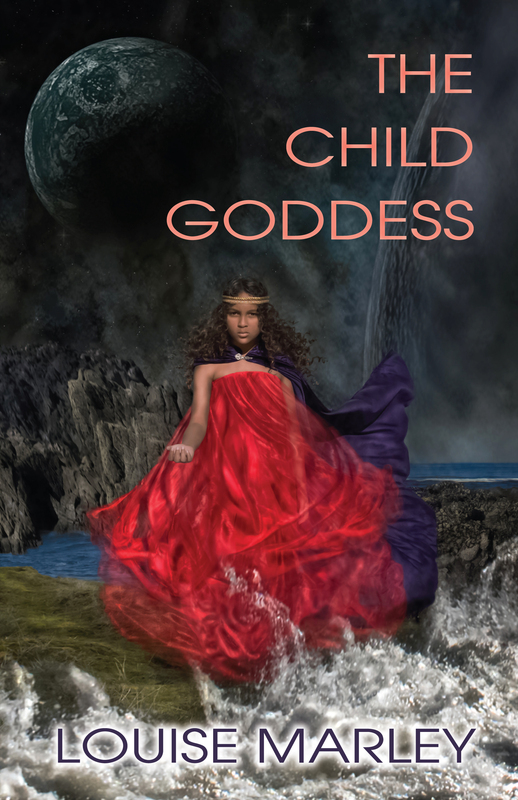 The Child Goddess is a tour de force of soft science fiction.
. . . Not just a science fiction adventure, this story also touches on themes of duty, honor and love without attempting to provide answers for any of those questions.
. . . The Child Goddess has a wonderful core of sf that follows Orson Scott Card and Ursula K. Le Guin . . . The book also features strong characterization and intensely felt personal dilemmas. . . It would be fabulous if all science fiction books had characterization as good as this book. As always, Marley writes with an insight that makes for compelling reading. The book's messages are timeless and timely. And as a bonus for Marley readers, The Child Goddess fits in with the universe introduced in The Terrorists of Irustan . . . John Jude Palencar lends his talents to the cover, as he did with The Terrorists of Irustan . . . It's a beauty, inside and out.